bleknervin has no other items for sale. 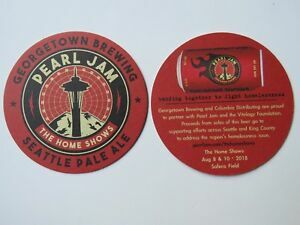 Details about Beer COASTER ~ GEORGETOWN Brewing Pearl Jam Home Shows Seattle Pale Ale ~ WASH.
Beer COASTER ~ GEORGETOWN Brewing Pearl Jam Home Shows Seattle Pale Ale ~ WASH. Please note the discount on combined orders and check our store for additional items. Please pay within 5 days. If NOT using Paypal.com to pay, please alert me of when and how you're paying.